The joke among futurists is that flying cars are 20 years in the future and always will be. But a company called AeroMobil has recently demonstrated an elongated, road-ready flying vehicle with stowable wings that can navigate both city traffic and the airspace between landings and take-offs from the world’s airports. Meanwhile, a company called South by Southwest is about to launch a flying roadster that will sell at roughly the cost of a high-end Tesla. Other entrants are Terrafudia, Moller International and PAL-V. Terrafudia has already accepted deposits from 100 customers for delivery of its flying cars sometime next year. There are hurdles. One is that all of these vehicles will have to pass numerous tests to prove they’re road-ready, fit to fly, and that a normal person would be able to operate them safely. Another is that most of the models—with the exception of Moller International’s Skycar (see illustration)—take off horizontally, which means you can’t pull out of your garage and take to the air. You would need to drive to the airport and take off on the runway. 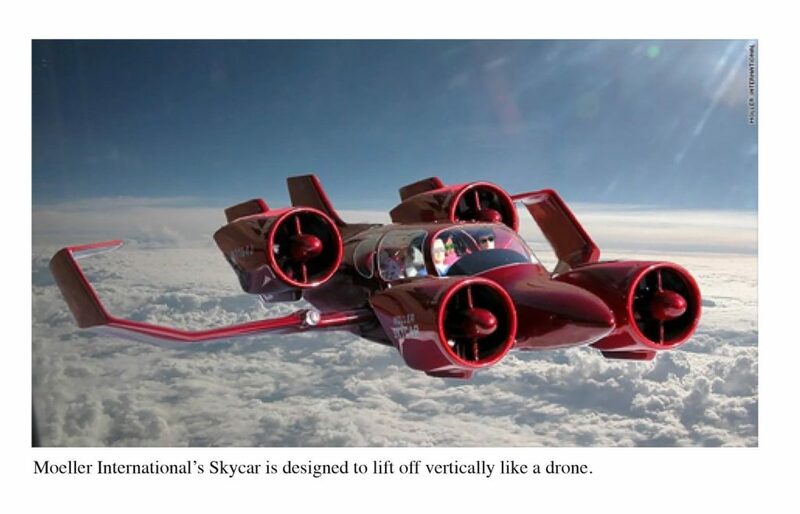 The Skycar, in contrast, is designed to lift off vertically like a drone directly from your driveway. Another hurdle, obviously, is cost. The South by Southwest vehicle, if it gets regulatory approval, will be the least expensive; the others will come with a starting price of $300,000 to $500,000, which will drop (as the price of electric cars has dropped) when companies get more customers that allows them to amortize their manufacturing costs—and force futurists to retire what may be their oldest joke.